Set only 30 km from the Welsh border, on the River Severn, Gloucester (pronounced 'Gloster'; pop. 110,000) is the county town and largest urban area of rural Gloucestershire. 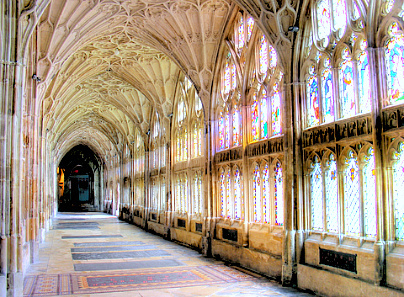 If there is one reason to visit Gloucester, it is for its magnificent Gothic cathedral. The only other noteworthy sight are the Victorian docks, which have undergone a recent facelift. 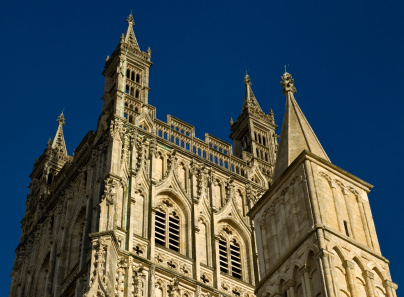 Gloucester can also serve as a convenient base for exploring the Forest of Dean to the west, the Cotswolds to the east, or the Malvern Hills to the north-west. Gloucester started its existence as the Roman colonia of Glevum, founded in the reign of Nerva (AD 96-98). The town remained important in Saxon times, especially after the foundation in 681 of St Peter's Abbey by King Æthelred of Mercia. It acted as a royal residence and a mint for the last pre-Norman kings of England. William the Conqueror met often with his court at Gloucester. His great-grand son Henry II granted the city a charter of liberties equal to that of London and Winchester in 1155. King John extended these privileges freedom from toll throughout the kingdom in 1200. Gloucester stayed in the spotlight in the following centuries as well. Henry III was crowned in St Peter's Abbey in 1216. Edward II, who was allegedly homosexual, was secretly murdered (or was it a natural death ?) at nearby Berkeley Castle, and subsequently enshrined in the cathedral. In 1483, Richard III made Gloucester a county of its own right. The Siege of Gloucester in 1643 was one of the most important battle of the English Civil War, as the king's forces resisted for 26 days the assaults of the parliamentarians. Although the city had been a major port in medieval times, the difficulty of navigating the River Severn up to Gloucester shifted most of the traffic to Bristol. However, a canal wad dug between Gloucester and Sharpness in 1827, rekindled trade. In Victorian times, Gloucester grew to become Britain's largest inland port, servicing some 600 ships annually, although its heyday waned soon afterwards. The coal, timber and iron from the nearby Forest of Dean assured Gloucester's quick industrialization in the 19th century. In the 20th century, Gloucester prospered on railway, motorcycles and aircrafts manufacturing. The city's focal point is Gloucester Cathedral. Its appearance in the Harry Potter films (as the corridors of Hogwart's School) has made it a world-famous sight. Founded in 681 as the Abbey of St Peter, the first proper church was constructed by Abbot Serlo in 1100. This first lackkustre edifice was replaced by the superb current cathedral after Edward II's murder in 1327. Gloucester did not become a diocese until 1541 (before that it belonged to the diocese of Worcester), when Henry VIII dissolved the abbey and elevated it to the status of cathedral. The cathedral adroitly combines every style of Gothic architecture with some elements of early English style. The heavy and sturdy Norman nave is balanced by the light and delicate Perpendicular-style porch and north transept and the Decorated Gothic south transept. The cathedral's eye-catching 69m-high tower was built in 1450 and is topped by four graceful pinnacles. The choir's mid-14th century east window, commemorating the Battle of Crecy, is the largest medieval window in the country. The crypt is one of the four apsidal cathedral crypts in England (along with Worcester, Winchester and Canterbury).Also worth noting is the great cloister the first, and one of the best example of fan-vaulting in England. The elaborate alabaster and marble tomb of Edward II, as well as that of Robert Curthose (eldest son of William the Conqueror), are in the southern ambulatory. There are memorials to two distinguished (although not very well-known) local residents : Edward Jenner (1749-1823), who developed the vaccine against smallpox, and John Stafford Smith (1750-1836) who composed "To Anacreon in Heaven" used for the tune of "The Star-Spangled Banner," the national anthem of the United States. Gloucester has a few historic buildings worth seeing, such as St Mary de Lode (the town's oldest church), the ruins of St Oswald Priory, St Nicholas House, the Blackfriars (a Dominican priory) and the 15th-century St Michael's Tower near Eastgate Market. The House of the Tailor of Gloucester, off Westgate St, has an exhibition dedicated to Beatrix Potter's famous story of the same name. But the most compelling and original feature of the city is certainly its Victorian dockyards, recently restored at enormous cost. They now houses the interesting National Waterways Museum, as well as restaurants and offices. Gloucester is located near the junction of the M5 (Plymouth-Birmingham) and A40 (Oxford-Gloucester) motorways. Trains connect Gloucester to Bristol (40min to 1h30min, £7.80), Worcester (35min, £6.50) and Newport (40min to 1h30min, £8.10). Trains to London (2h50min, £28 super advance single) require a transfer at Bristol. National Express has frequent coaches to London (3h20min, £14.50), and fewer ones to Bristol (50min, £5.75), Birmingham (1h30min, £8.25), Hereford (50min, £4.75) and Worcester (1h, £4.75).